Attorneys representing 10 local, state, and regional organizations sent a letter today to the members of the State Water Control Board, urging the Board quickly start a process to revoke the water quality certification issued for the Mountain Valley Pipeline (MVP). At the same time, the attorneys strongly urge the Board to use enforcement tools available to it to stop work on the pipeline while the revocation process goes forward. These attorneys were answering a letter MVP sent to DEQ Director David Paylor on February 12, 2019 that was subsequently given to Water Board members. MVP claims that a “cooperative effort [between MVP and DEQ] on the Project has achieved a high level of environmental protection and overall is in very good order.” However, the evidence demonstrates otherwise. Today’s letter also provides arguments to counter MVP’s contention that the state lacks authority to revoke the certification. The company claims Virginia passed up its chance to rule on the certification in the first place and that a condition imposed by Virginia allowing revocation is not enforceable – this in spite of the fact that MVP went to federal court to defend this same certification. In response to requests for documents about meetings and deliberations that may relate to Dominion Energy’s proposed Atlantic Coast Pipeline, the Governor’s office has supplied some records but has withheld other, crucial information. When faced with a choice between open government and concealment, Governor Northam made the wrong choice, relying on state law provisions that allow, but do not require, him to shield certain public information from the people of Virginia. Did Governor Northam manipulate the process for Air Board appointments to influence the upcoming decision on Dominion’s proposed Buckingham compressor station for the Atlantic Coast Pipeline (ACP)? Did Governor Northam discuss the ACP and Air Board appointments in a private meeting with Dominion officials on November 19, when a public furor over the changes in Air Board membership was raging? As we stated in our FOIA requests, while we anticipated that the administration may claim the exemptions provided in the statute, we hoped they would choose to let the public see the records. Statements from the Northam administration about the Air Board personnel changes have been met with widespread public skepticism (See: Northam’s struggle to explain air board move suggests it’s exactly what it appears to be, Virginia Mercury, December 5; ‘Ugly episode:’ Northam allies slam his decision to alter board before Dominion vote, Washington Post, November 27; Northam can seek independent voices, or mere rubber stamps, for his boards, Virginian-Pilot, November 23). If assertions provided by administration spokespersons are true, the Governor could only benefit from a full public airing of the records. His hesitancy to do so can only contribute to Virginian’s doubts and taint the regulatory process for the ACP. The email responding to the FOIA request can be found here. The administration states that “the Office is withholding five documents pursuant to Virginia Code Section 2.2-3705.7(2).” This Code section allows for withholding of records deemed to be “working papers” in the possession of the Governor’s office. At this link is a document combining a series of emails and other correspondence to (and between) government officials regarding both Air and Water Board membership. Many of the records include recommendations from various parties for members of both Boards, applications and resumes from candidates, and correspondence with members of the news media. It is notable that there are emails from late October through November 7, 2018 where administration officials mention plans to discuss Air and Water Board appointments, indicating that these processes had begun before the Air Board’s November 9 meeting. However, there is a gap in the correspondence within the Governor’s office followed, abruptly, by letters from the Governor dated November 16, 2018 asking the Secretary of the Commonwealth to prepare commissions for the prospective appointees. The key factor, the advice and reasoning followed in making these decisions, is entirely missing. Again, the excluded information could possibly answer some of the questions to which the public demands answers. The bottom line is that we still don’t know whether the Governor’s actions were influenced by concerns that the dismissed Air Board members, Ms. Rubin and Mr. Bleicher, had expressed about DEQ’s proposed Air permit for the Buckingham compressor station. In emails setting up the meeting parties mention an initiative between Dominion and Smithfield addressing “a major methane containment proposal” as the stated purpose for the meeting. Given that the Governor’s office has cited this same reason for the meeting and that the project has now been widely publicized, if no other matters were discussed, we must wonder what those concealed records pertain to. We believe the circumstances surrounding the Air Pollution Control Board appointments continue to create a question whether principles of due process have been breached for the Buckingham compressor station permit. We hoped the Governor would remove this cloud of doubt. Wild Virginia calls on the Governor to correct this problem and we call on our members across Virginia and our allies to continue to call for Rubin and Bleicher to be allowed to vote at next week’s Air Board hearing. The people of Union Hill and all Virginian’s are depending on a fair process and this action can help ensure it. Wild Virginia sent letters to the office of Governor Ralph Northam on November 21, 2018 asking for records related to two vital issues in the State of Virginia’s actions to regulate the Atlantic Coast and Mountain Valley pipeline projects. Second, we requested records that would reveal the Governor’s process for deciding whether and when to remove members of the Air Pollution Control Board and the State Water Control Board.” The timing of dismissals of two members from each Board, especially the two Air Board members who had expressed concerns about the permit for ACP’s Buckingham compressor station, has raised serious questions as to whether the Governor has sought to influence what are supposed to be independent citizen Boards. All of these members’ terms had expired at the end of June this year and their sudden removals just weeks before the Air Board is to make a final decision on Buckingham air permit, raises serious questions. Was this action taken to influence the outcome of that vote? Can newly-named Air Board members possibly be adequately prepared to judge the complex issues involved by the time the Board meets on December 10? Will this action have a chilling effect on Board members who may question DEQ’s proposals in the future? Full disclosure in regard to both issues we’ve addressed is necessary and we hope the Governor will live up to the ideals of open and honest government he has espoused. Stay tuned for news of his response to our requests. As we turn onto the dirt lane leading to Spruce Creek Camp-Out up the hill, we run into a small group of folks walking down the road. My husband and I have driven out to Nelson County to join the last of three weekend campouts in October organized by activists on land threatened by the proposed Atlantic Coast Pipeline (ACP). 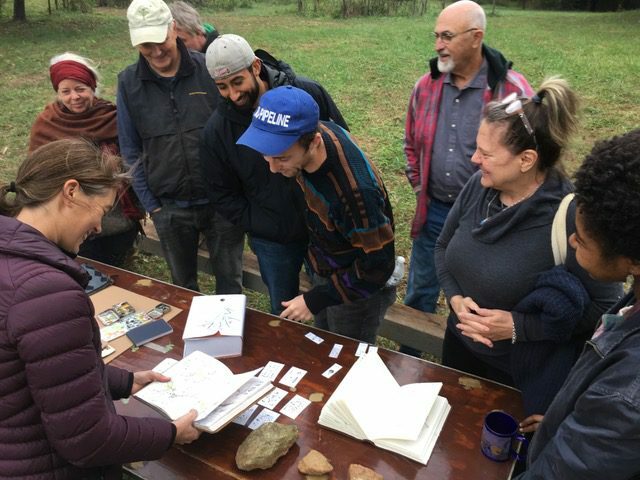 We are invited to pull our car off the road and join the group on a nature hike led by Robert Jennings, a local naturalist and grassroots field specialist for the Chesapeake Bay Foundation. This is only one of the many talks, presentations, and tours of local properties that would be impacted by the proposed pipeline that are being offered by Nelson County residents and invited experts during the Spruce Creek Camp-Outs. many gifts if only we pause to appreciate them. Having someone like Jennings along can help to slow us down and bring more meaning to our interactions. It also makes what is at stake here strikingly clear. fields of West Virginia to its terminus in eastern North Carolina. As I listen to the deafening stream, so full of energy in its rush from the Blue Ridge Mountains to the sea, it is hard to imagine this beauty being broken. And yet, this is the fragility of the world in which we live. All of it requires our protection. 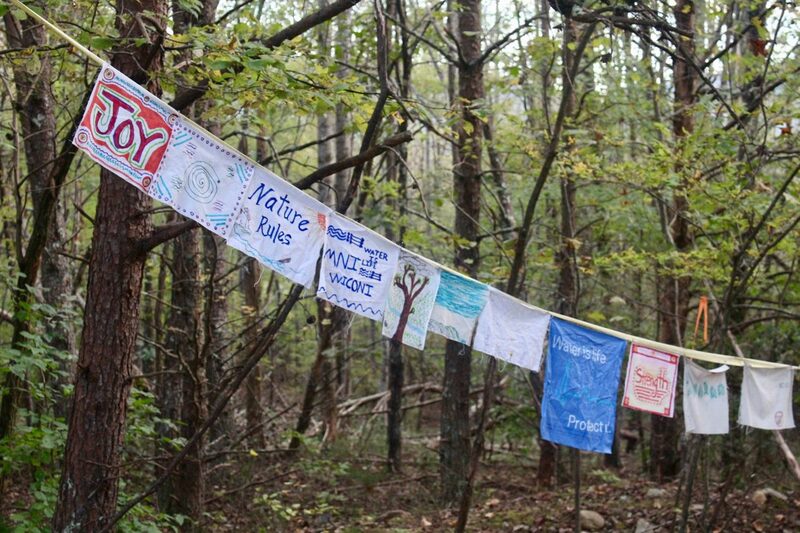 On our climb back to Camp to set up tents and prepare for an evening of educational talks and communion with other campers, landowner Jill Averitt points out a string of hand-painted prayer flags dancing in the trees. 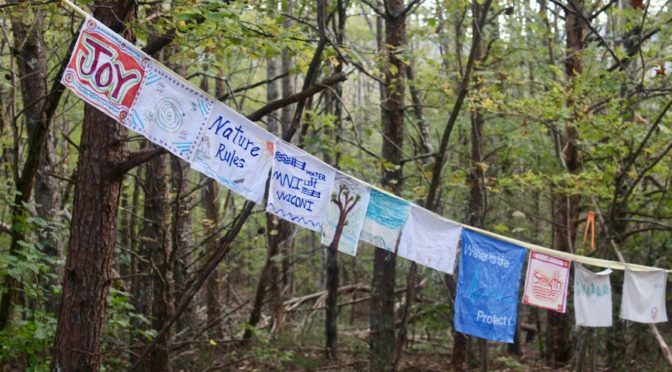 Made by past campers and volunteers, the ever-lengthening line is strung across the proposed pipeline’s ‘right-of-way’ through the heart of their property. I think about the contractors’ orange ribbon also strung through these trees. The woods, for the moment, are silent holding these competing dreams in their swaying arms. humbling presentation on the state of climate science. 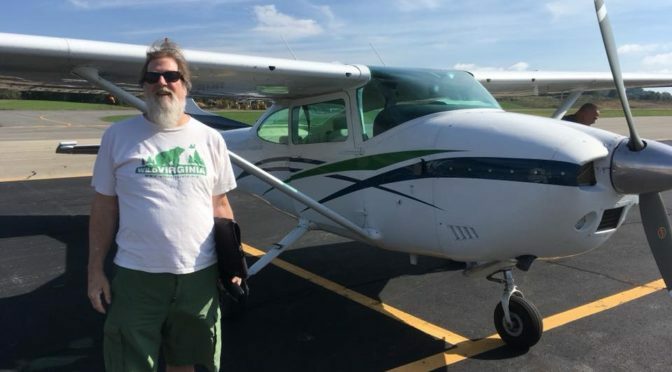 He is self-trained, the most inspiring kind of citizen scientist, who after living through Hurricane Katrina, gave up flying, buying new cars, and has lived a simple life since sharing his knowledge of global warming with others and inspiring them to action. As the night gets colder, we circle round the fire. Friends and neighbors from Nelson County share stories of their own fights against the proposed pipeline, the court battles they’ve weathered and Congressional hearings they’ve testified at, the stress and sense of loss they’ve suffered, and the fight they’ve supported and are still supporting their friends through. One couple has driven up from Hampton Roads, where their own community is struggling to organize in opposition to a spur of the ACP that is already on its way into the ground. They are here for leadership and inspiration, coming from a community where so many folks, too down on their luck to fight Dominion Energy, have taken a check and gotten out. Fresh to the fight and the full complexity of how pipelines are built and resisted, my husband and I simply listen and take it all in. To be invited so intimately into peoples’ lives and personal struggles feels like such a gift. I do not yet know what I can do to help, but for the moment just gathering and being present seems important. Although some consider it to be a done deal, this fight is far from over, and even if the ACP goes in the ground, folks all along its path will be standing by their land, protecting what they can, and reporting issues that will impact all of us who live downstream. For more information on how you can get involved from wherever you are, get in touch with the Allegheny-Blue Ridge Alliance and check out the Dominion Pipeline Monitoring Coalition, which is rewriting the books on how citizens do science and resist projects such as this. 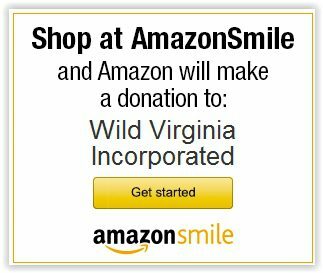 Wild Virginia and many other organizations are continuing to fight the pipelines as hard as we can. 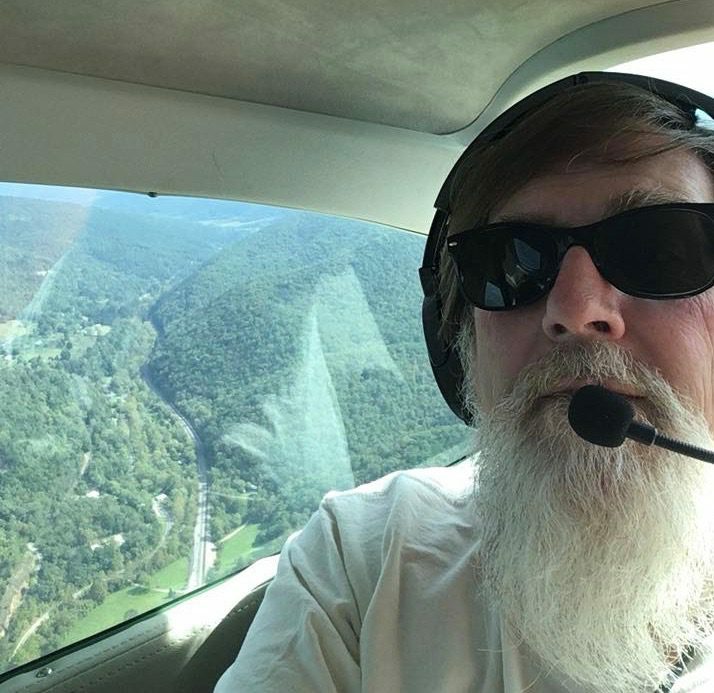 In early October David Sligh, Wild Virginia’s conservation director, went up in the air with SouthWings to view the route of the Mountain Valley Pipeline (MVP) and observe the construction currently being done. SouthWings is a non-profit that works for the protection and preservation of the environment through flying over natural areas to educate citizens about their importance. 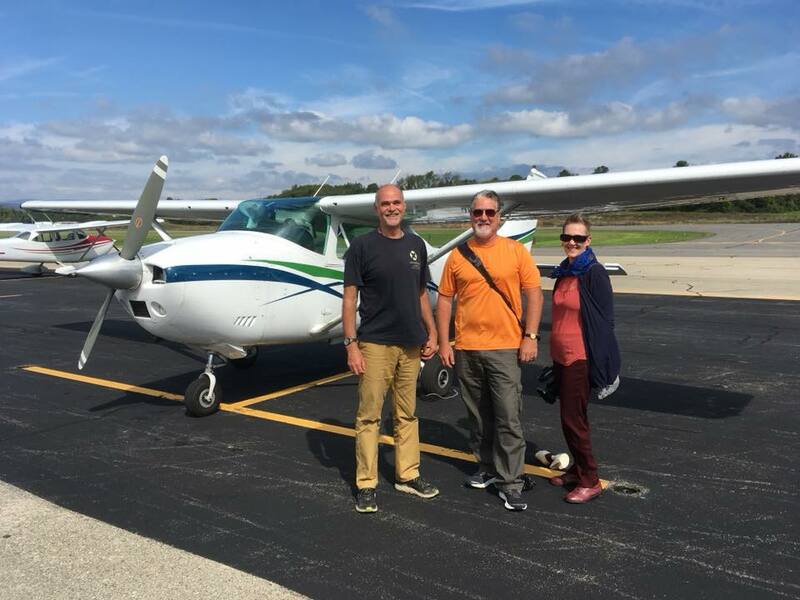 SouthWings offered David Sligh a spot on two of their flights this October to be a guide to reporters that wanted to observe the pipeline from the air. I got a chance to talk with David Sligh to hear more about this experience that gave him new perspective and vigor in continuing to fight the MVP. The flight provided the reporters and David views of the pipeline route from Montgomery County and east to Franklin County. This area of the pipeline route offered important views because it contains various stages of construction of the pipeline. These views range from swaths of both uncut trees and cut trees, grading to prepare the ground for the pipes, and sections where the pipes are already in place. David was especially interested in looking at the pipeline in Franklin county because he heard reports that the construction crew there dug a trench and placed the pipes, but this trench has filled with water, just sitting for several months. This remains concerning because residents worry about potentially polluted water from the pipeline seeping into groundwater and wells, if the pipeline construction crew does not empty the trenches currently filled with water. The view from the sky revealed this concerning spot, with the pipe visible floating in this trench full of water. One of the most impactful parts of this trip for David was the view of the incredibly narrow ridge tops slated for destruction in order to construct the pipeline. This bird’s eye view of the pipeline route emphasized the full extent of the mountain top removal that MVP will require. The government states that they will restore the mountain tops, but David views this as an absurd proposition, one cannot simply restore mountain tops that have been blown off. David Sligh on the SouthWings flight with pipeline construction behind him. Even in the face of this current and imminent environmental destruction in the name of the MVP, David remains zealous and ready to continue to pursue action to fight the MVP. This experience strengthened his concerns about the MVP and helped to endorse actions that Wild Virginia has already pursued with regard to the MVP. David hopes more government officials, policymakers, and reporters can venture up into the sky and see the impact of the MVP, but even on the ground on your computer you can check out aerial views of construction of the MVP and the Atlantic Coast Pipeline. I first became aware of the Rusty Patched Bumblebee through the enthusiastic advocacy of my good friend, conservation photographer Clay Bolt. Clay has worked tirelessly to raise awareness about the decline of this species through photography, film and even testimony before Congress. As a Virginia resident, I was excited to learn that a Rusty Patched Bumblebee had been spotted at Sky Meadows State Park in 2014, the first evidence that this bee had not gone extinct in this part of the country. In the summer of 2017, a survey for the Atlantic Coast Pipeline found a lone Rusty Patched Bumblebee in mountainous western Virginia. Because of its proximity to the pipeline route, that sighting triggered the concern of the Southern Environmental Law Center. 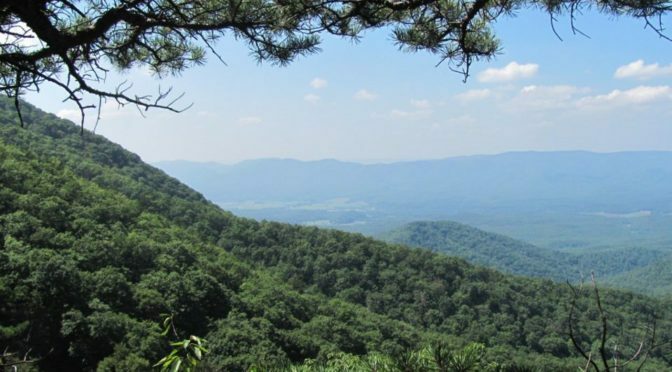 SELC, representing Defenders of Wildlife, the Sierra Club, and Virginia Wilderness Committee, argued that the U.S. Fish and Wildlife Service had not complied with the law when it issued an Incidental Take Statement for multiple endangered species including Bombus affinis. A closer look through my images revealed a Rusty Patched perched just below a butterfly! In the summer of 2018, the 4th Circuit Court vacated the permits for the pipeline, and the Federal Energy Regulatory Commission temporarily halted construction of the pipeline. Shortly before this ruling, I was contacted by private landowners (also impacted by the pipeline route) who thought they might have Rusty Patched Bumblebees living on their property in Bath County, Virginia, near where the bee was found in 2017. On July 28, I made the trek to the beautiful country home of Bill and Lynn Limpert. Bill informed me that a state agency had found a second Rusty Patched Bumblebee just the week before in the nearby George Washington National Forest. After a day of searching and photographing for RPBB with Bill, I thought I had come up a short, but a closer look through my photos of the Limpert’s back yard revealed a Rusty Patched perched just below a butterfly! The location of this individual was approximately 600 feet from the centerline of the Atlantic Coast Pipeline. Bill and Lynn Limpert at Miracle Ridge, the area of their property slated for pipeline development. 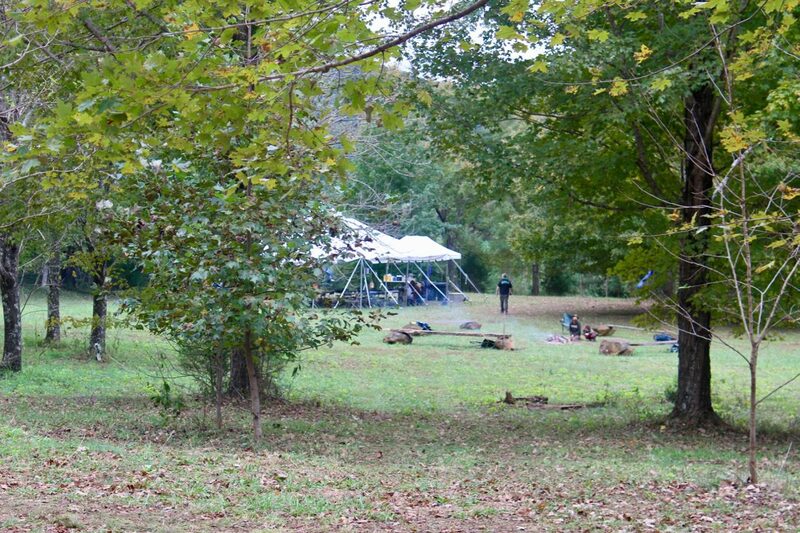 I quickly alerted Virginia state agencies to this find on private land. In the following weeks, the Virginia Department of Conservation and Recreation’s Natural Heritage Program initiated new surveys that turned up another twenty Rusty Patched Bumblebees! 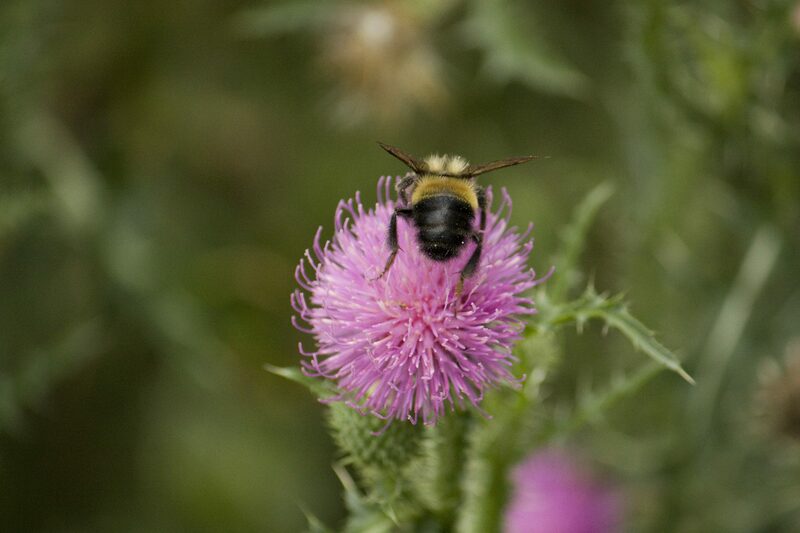 Bill was also able to photograph Rusty Patched Bumblebees on his property. As of September 22, pipeline construction is back on, but the Southern Environmental Law Center (advocating for Sierra Club, Defenders of Wildlife and Virginia Wilderness Committee) is already mounting a new legal challenge with the hopes of protecting the Rusty Patched Bumblebee and other endangered species in this rugged and scenic area of Virginia. Rusty Patched Bumblebee photo by Bill Limpert. Steven David Johnson is a photography professor and conservation photographer based in the Shenandoah Valley of Virginia. 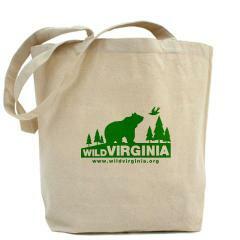 He is the Vice-President of Virginia Wilderness Committee. Modernizing logging laws with climate-smart practices. Permanently protecting remaining old-growth forests and encouraging forest restoration on public lands. 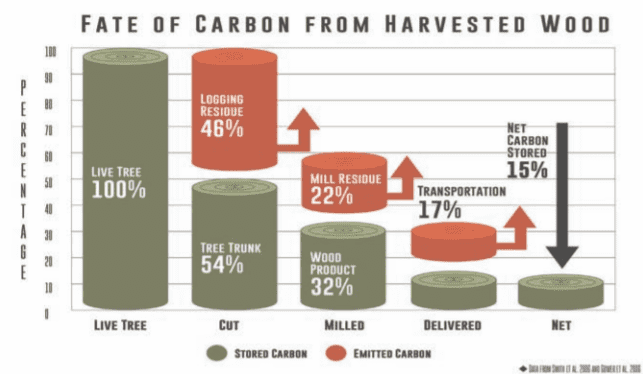 The graphic below depicts the fate of carbon during forest logging. After a tree is logged, the stump only retains 15% of the initial carbon storage. Expanding permanently protected lands and protect public lands from commercial logging and other harmful activities. Reducing emissions from the forestry sector and expanding the US forest carbon sink as a major climate strategy. Investing in forest protection as a resiliency and adaptation strategy for communities vulnerable to pollution and climate change. It’s always exciting to discover different groups coming to a consensus on a solution. We know we are on the right track, so what’s the next step in guaranteeing forest conservation? How are we going to save our wild spaces and protect our climate? You can help today by endorsing our Stand 4 Forests campaign and voting on November 6th for candidates who support our forests. Have you seen a more beautiful bee? This amazing bee, known as the rusty patched bumble bee (RPB) is unfortunately federally endangered. 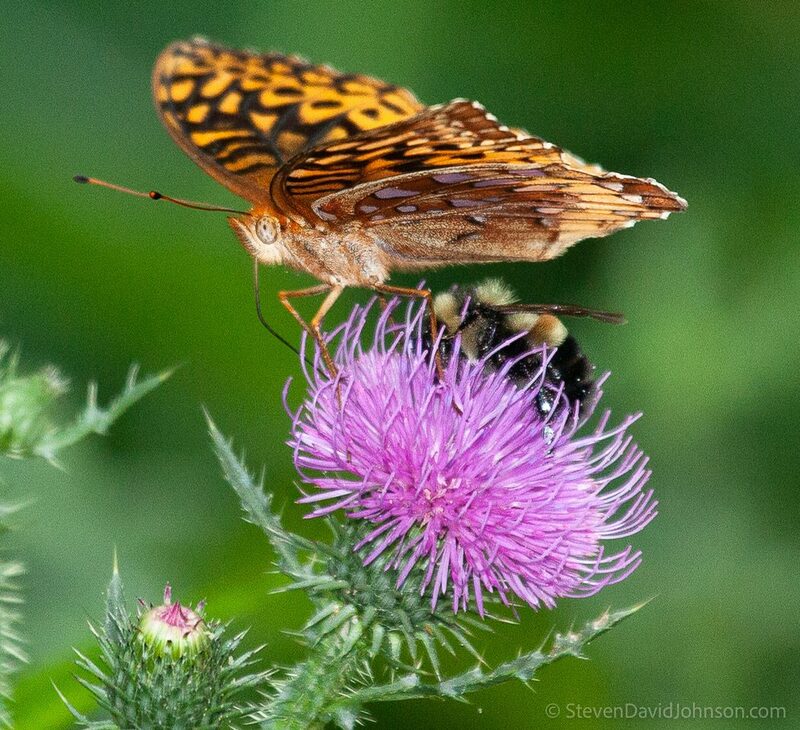 On October 15, 2018, Wild Virginia’s David Sligh filed public comment to express concerns about how this bee will be effected by the Forest Service’s Duncan Knob Gypsy Moth Proposal. These comments raise important concerns about how this project will impact the bees and the need to further study these effects before the project moves forward. Read the full comments here and continue reading below to learn about the background and main points of our latest comments. 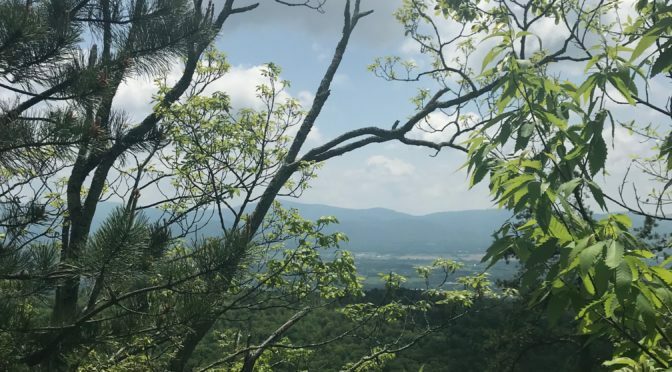 The forest service originally filed the Duncan Knob Gypsy Moth Proposal in May of 2017, which has been met with various concerns. Wild Virginia filed comment in July 2018. The Forest Service originally proposed the project to mitigate the effects of an infestation of gypsy moths on National Forest Service Land comprising part of Duncan Knob. The Forest Service’s stated goal with the project is to promote oak regeneration and salvage trees effected by the gypsy moth. 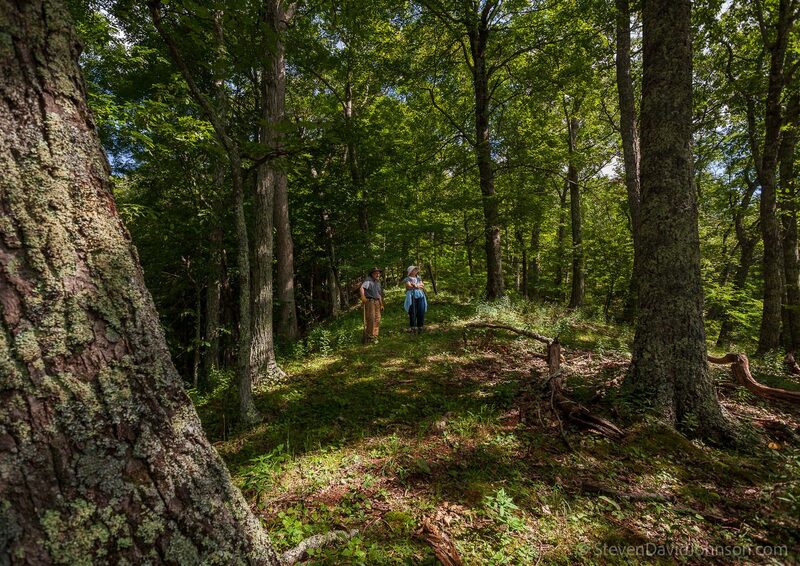 In Wild Virginia’s comments from July we argued that “the benefits of cancelling this project far outweigh the costs of implementing it,” citing concerns with interfering with the health of the forest through implementing the proposal of removing the gypsy moths. Wild Virginia’s main concerns with the rusty patched bumble bee and this project revolve around the use of a categorical exclusion instead of an environmental assessment. As will be discussed below, there are large potential impacts of this project on this endangered species, so the Forest Service must conduct an environmental assessment if it chooses to continue with the project in order to stay in accordance with the National Environmental Policy Act. The categorical exclusion simply does not go far enough to assess the impacts this project could have on this endangered bee. With regard to rusty patched bumble bees and this project the first question one must answer is whether or not these bees actually live in this area. The U.S. Fish and Wildlife Service admits that there is uncertainty and many unknowns about the habitat and range of the Rusty Patched Bumble Bee. This alone raises concerns about this endangered species. Why implement a project in an area where there are still questions about the presence of an endangered species? However, the U.S. 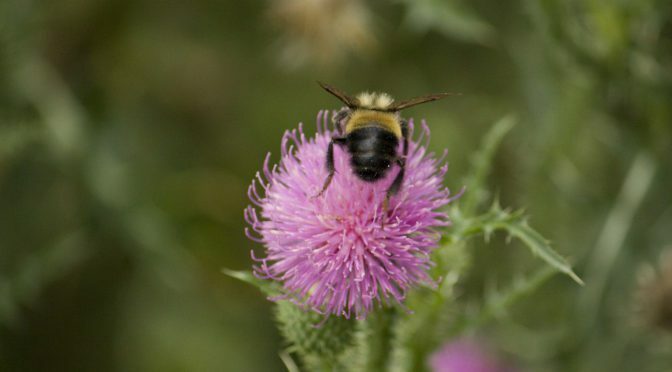 Fish and Wildlife Service in relation to the Atlantic Coast Pipeline (ACP) identified a High Potential Zone (HPZ) in which the rusty patched bumble bee may be found. One must pay special attention to this because a number of areas of the Duncan Knob Gypsy Moth project fall in the HPZ. This means there is evidence that habitats and populations of the bee will be affected by the project. Activities proposed for the ACP overlap with those proposed for this project, so analysis around concerns for the rusty patch with the ACP can be applied to this project. These detrimental activities include the clearing of the bees’ foraging habitat and human disturbances, which may harm or kill the rusty patch. Clearly there are uncertainties and concerns about harm so an environmental assessment is necessary to determine how this project will affect the bee before moving forward. On September 13, 2018, the United States Forest Service published two advanced notices of proposed rulemakings (referred to as ANPRMs). The notices aim to streamline regulations regarding the exploration and development of oil, gas, and locatable minerals in national forests and grasslands. Locatable minerals are recognized as a mineral by the scientific community and make the the land more valuable for mining than for agriculture. Examples include gold, silver, limestone and copper. A 30-day public comment period regarding the implementation of existing regulations and these new proposed rules ends October 15. The two proposals, 36 CFR 228 Subpart A: Locatable Minerals, and 36 CFR 228 Subpart E: Oil and Gas Resources, are trying to expedite the Forest Service review process of projects in order to speed up development and benefit those who are trying to develop land instead of those who are trying to protect it. Speeding up the review process hurts the quality of environmental reviews and the ability of the public to submit comments. Activities related to excavating locatable minerals, oil or gas require a thorough environmental review. In recent years, the Forest Service has experienced issues with staffing and funding because they have diverted so much of their budget to fighting wildfires. 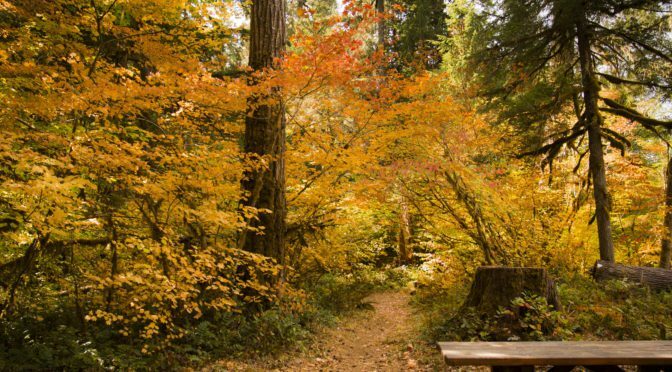 Thus, it is extremely important for experts and citizens to have appropriate time to weigh in on potential Forest Service projects. The Forest Service must not be allowed to abdicate its responsibility of protecting our national forests and grasslands. Please make a public comment today to ensure our wild areas are given priority over energy developers. By hard copy: Submit by U.S. mail to: USDA-Forest Service. Attn: Director—MGM Staff, 1617 Cole Boulevard, Building 17, Lakewood, CO 80401. 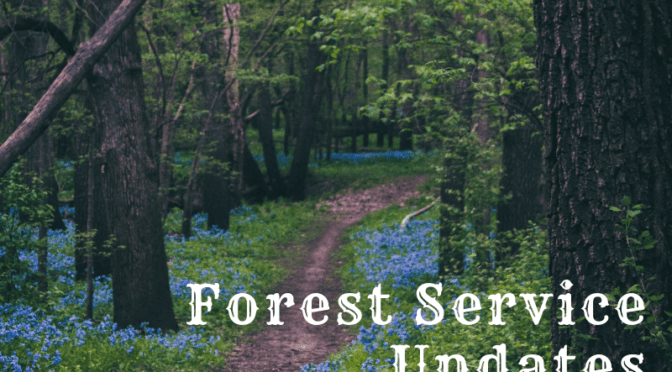 Mail: Address written comments to USDA-Forest Service. 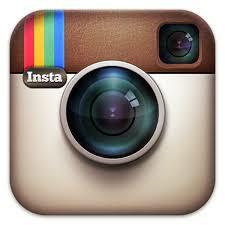 Attn: Director-MGM Staff, 1617 Cole Boulevard, Building 17, Lakewood, CO 80401. There is still time for you to tell the Virginia Air Pollution Control Board to deny Dominion’s application for a permit to release air pollution that will threaten the health and well-being of residents in the Union Hill neighborhood and beyond. 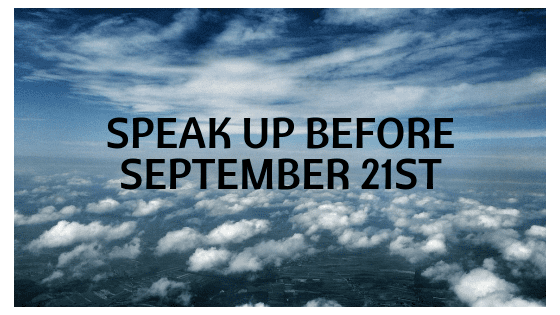 The public comment period has been extended to September 21, 2018, so don’t wait – let your voice be heard. The draft permit prepared by the Department of Environmental Quality (DEQ) is woefully deficient, failing to provide the analyses and the levels of protection the law requires. Dozens of people spoke at a public hearing on September 11th, most explaining technical and legal problems with the proposal and opposing issuance of the permit. Please add your voice to that strong message, to let the citizen members of the Air Board know you oppose this illegal and unethical proposal to victimize citizens for private profit. Even if you lack technical expertise, you can raise important issues the Board is legally-obligated to consider. DEQ has failed to properly consider whether the placement of the facility is appropriate or to acknowledge the violation of environmental justice principles. DEQ officials have stated that the Department and the Board lack authority to consider issues related to the need for the project and proper siting of the station. State law explicitly contradicts this position. The State of Virginia not only has that authority, it has a solemn obligation to exercise it. The scientific and economic practicality of reducing or eliminating the discharge resulting from such activity. Code of Virginia § 10.1-1307.E. A mountain of evidence proves that Dominion’s claims about the need for gas to be supplied by ACP are untrue. Importantly for this permit review, DEQ has refused to acknowledge this information or to incorporate it into its analysis of Dominion’s application for the air permit. This deficiency is directly pertinent to the “reasonableness of the activity involved” and the “social and economic value of the activity involved,” which the Air Board must consider. Code of Virginia § 10.1-1307.E. Weighing against the lack of need for the project are the social and economic costs that will be imposed on the communities directly affected by the compressor station. The disproportionate impacts the compressor station would have on the African American community in and around Union Hill are clearly shown. The Federal Energy Regulatory Commission (FERC) relied on incorrect and incomplete information about the local community to dismiss environmental justice and siting concerns. The Air Board must demand that DEQ provide and analyze correct data on these issues and must reject this permit unless and until the Department does so. The Air Board is required to consider these facts in an analysis of the “character and degree of injury to, or interference with, safety, health, or the reasonable use of property which is caused or threatened to be caused” and the “suitability of the activity to the area in which it is located.” Code of Virginia § 10.1-1307.E. The Board must reject the draft permit prepared by DEQ and require that all pertinent siting considerations be investigated and analyzed before it considers the proposal further. FERC relied on incorrect data from Dominion to conclude in its final environmental impact statement on the ACP that, on average, there are 29.6 people per square mile in the area surrounding the pipeline’s path in Buckingham—that number was provided by the U.S. Census Bureau. However, a survey of the community by Friends of Buckingham showed that FERC’s number was off by about 500 percent. DEQ has also failed to account for the fact that these areas have unusually large percentages of elderly people and children, both of which are especially sensitive to the kinds of air pollutants the compressor station would emit. Based on that and other findings, the ACEJ recommended the “Governor direct DEQ to suspend the permitting decision for the air permit for the Buckingham compressor station pending further review of the station’s impacts on the health and the quality of life of those living in close proximity.” See ACEJ letter, dated August 16, 2018, at Environmental Justice Review of Virginia’s Gas Infrastructure. The ACEJ also recommended Governor Northam convene an Emergency Task Force on Environmental Justice in Gas Infrastructure. See article about the ACEJ’s action at Governor’s Advisory Council Call for Moratorium on Atlantic Coast and Mountain Valley Pipelines, Global Justice Ecology Project, August 29, 2018.